Home » Big Idea Tech Blog » Blog » Skype for Business PSTN Conferencing: A complete online meeting solution! Skype for Business PSTN Conferencing: A complete online meeting solution! Online meetings are becoming increasingly popular. Online meetings using video conferencing solutions enable people in different locations – from the same company or from several companies – to meet virtually, without the need to spend time and money on travel. Businesses use video conferencing solutions to conduct live meetings, offer presentations and webinars, collaborate, and provide remote training. Because it is integrated with Office 365, if you are presenting a meeting, your presence status will show as “Do Not Disturb” and messages sent to you while you’re presenting will be emailed to you to view later. To meet company security needs, transmitted instant messaging, audio and video in Skype for Business are protected by strong authentication and encryption; however, the part of the call that takes place over PSTN (“Public switched telephone network” – the ordinary phone network) is not encrypted. If you already have a Microsoft Office 365 Enterprise plan, Skype for Business PSTN Conferencing is the most cost-effective online conference solution! It is included in Microsoft Office 365 E5 plan, and is available as an add-on to the E3 and E1 plans at a cost of $4/user/month. Only the users who conduct meetings need to have the PSTN Conferencing add-on; other users can use Skype for Business to participate in meetings. Note that Skype for Business (without PSTN – the phone number for dial in) can be used for instant messaging, video chat, collaboration and presenting in an online Skype meeting as part of other Office 365 plans. The cost of Skype for Business as an add-on to other services is just $2/user/month. Starting a Skype for Business meeting is simple. In the mail screen of Outlook, click New Items on the Home tab, and then click “Skype Meeting.” Or, In the calendar screen of Outlook, click “New Skype Meeting” on the Home tab of the ribbon. 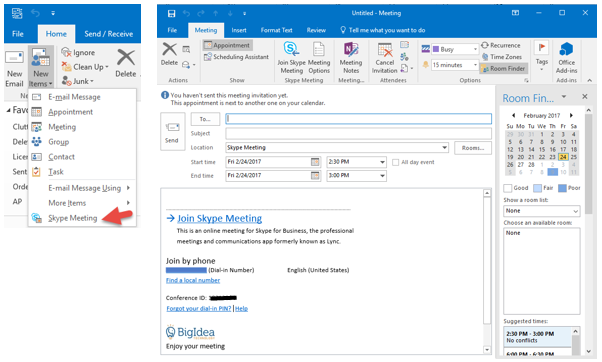 A popup will open to schedule and send the meeting which includes a link to “Join Skype Meeting” and a phone number to join by phone. Fill in the subject of the meeting and the email addresses of the invitees, and if desired, enter a description of the meeting at the top of the email message, and then click “Send.” It’s as easy as sending an email! 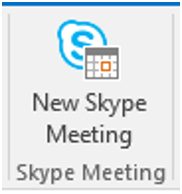 To participate in the meeting, participants simply click “Join Skype Meeting” in the emailed invitation. It’s that simple! Meeting participants who have Skype for Business Client will automatically join the meeting. Meeting participants who don’t have Skype for Business Client are directed to the Skype for Business Web App where they can fully participate in the meeting. If they don’t have internet access, meeting participants can also join by phone to listen to the audio aspect of the meeting by calling the phone number that is included on the invite. If they prefer, then can click “find a local number” to pick a local phone number from one of more than 60 countries around the world, or from one of several cities in the U.S.
During the Skype Meeting, participants can view the presentation, download documents, and participate in the online chat. If the features are enabled, they can also view the participants and join in the verbal discussion. Our goal, as an IT services provider, is to help our clients get the most from their technology. Microsoft’s Skype for Business PSTN Conferencing provides an alternative to WebEx and GoToMeeting at a lower price than that of these other third party conferencing solutions. It also allows for a larger number of possible participants – which is a nice feature for webinars! Skype for Business is fully integrated with Outlook, which simplifies sending a meeting request and which incorporates presence when a meeting is scheduled – the feature in Outlook and Skype for Business that shows by color whether you are available (green), busy (red) or away (yellow). It is easy to use and sound quality is great! In addition, the Skype for Business App is available across all your devices including computer (PC and Mac), tablet and mobile (for Apple, Android, and Windows devices). At Big Idea Technology, we use Microsoft’s Skype for Business PSTN Conferencing for our own conferencing needs – including for holding our weekly staff meeting to enable our staff who are offsite to participate. We also use Microsoft’s PSTN Calling with Cloud PBX, Microsoft’s phone offering, but that’s a topic for another blog post. The demand for online meetings is increasing. We enthusiastically recommend Skype for Business PSTN Conferencing! Call us if you’d like to find out how to get it!